Pacifica Del Mar reflects the soothing calm of its ocean location. 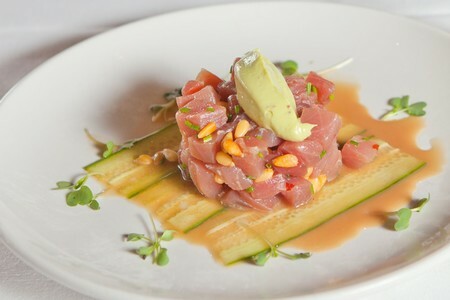 Perched high atop the Del Mar Plaza, the sophisticated restaurant offers a stunning visual Pacific feast to accompany Chef Christopher Idso’s delightful gastronomic feats. The menu features elegant California-inspired creations that manage to be both light and clean, while still imparting a deep satisfaction. Mouthwatering options like the Barbecued Sugar-Spiced Salmon with Chinese beans and mustard sauce, Moroccan Spiced Prawns, and Filet Mignon with potato-white cheddar gratin, make for delightful dining dilemmas. Sample from Pacifica Del Mar’s Wine Spectator-distinguished wine list to help make the decision-making process that much more enjoyable. 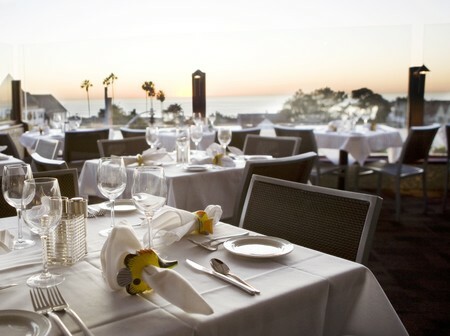 Pacifica Del Mar’s expansive enclosed patio allows diners to savor spectacular unobstructed views of the Pacific Ocean. At sunset, sea and sky converge to offer a seemingly endless expanse of color and enchantment. 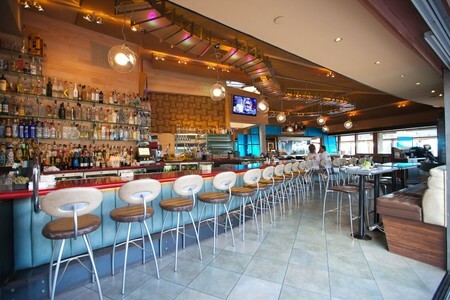 The restaurant is inconspicuously perched on the upper level of the Del Mar Plaza, and takes full advantage of its prime location by serving its coastal cuisine in three distinct dining spaces that compliment the breathtaking scenery. The seductive color variations of the deep sea are captured in the elaborate lighting that bathes the bar area in rich tones of blues, reds, and purples. Pacifica also has two distinct dining spaces: the indoor dining room and outdoor patio. Passing the large aquarium and two steps that lead up to the dining room from the bar, visitors are greeted by a vibrant and sophisticated dining space. Four large abstract light sculptures line the back wall of the room and may remind diners of the course the sun takes over a drifting tide. The patio space is minimally decorated, yet equally stunning. The railings and overhangs separate and frame the Del Mar coastline like a great painting hung on a gallery wall. Clear plastic coverings also hang down to shield diners from the wind as they feast. We were lucky enough on the night of our visit to procure a table on the bustling patio, and quickly realized views from the center of the room are suitably spectacular. The first menu diners may reach for is Pacifica’s impressive wine list. It has been honored with The Wine Spectator’s “Award of Excellence” every year since 1992, and offers patrons a truly staggering selection to choose from. The thickly bound book separates varieties by “White” and “Red,” “By the Glass,” “Featured Winery,” and “Half Bottles.” New World charm permeates the menu with California based wineries mingling among Australian and New Zealand brands. The result is a truly thoughtful collection of wine that compliments the food menu with a well-defined perspective and scope of interest. Our meal this evening opened with a sampling of Pacifica’s famous soup. On the menu for years, the Japanese Clam Chowder is a dish that draws many visitors to return. This rich chowder is not to be confused with the New England icon; for while the savory broth is home to delicate bites of fresh clam, the broth itself is a blend of shitake mushrooms, and has no cream. Crunchy slices of water chestnuts contrasted against the smooth chewiness of the large pieces of mushroom, and offered a delightful play on texture. Tastes of sweet and peppery scallions grabbed attention from the intense savory richness of the broth, and complimented the hint of soy sauce in the background. This chowder is both a fine introduction and a satisfying meal in its own right. The next course of our meal consisted of three appetizers our server recommended: Dungeness Crab Cakes, a Roasted Chino Farms Beets salad, and Spicy Calamari. The Dungeness Crab Cakes arrived on a long rectangular plate dashed with artful brushstrokes of a green remoulade butter sauce. Between the two cakes sat a refreshing arugula micro salad that juxtaposed the bitter notes of the herb against slightly sweet hints of onion and apple. The cakes themselves were a fine illustration of textural balance – the crunchy outer layer broke away to expose a moist center of lump crab meat held together by a subtle mix of breading and herbs. The taste was light, mild, and showcased the sweeter notes of the crab meat. The sea-dwelling counterpart to the salad was the large bowl of Crispy Calamari we were next served. Staring into the slanted white bowl that was reminiscent of an oyster shell, we were struck by the immense portion size of the lightly breaded rings. Accompanying the dish were two dipping sauces: a spicy Vietnamese fish sauce, and a red pepper aioli made with hot mustard. Each sauce coaxed out subtle elements of the calamari. For example, the Vietnamese sauce was mildly sweet and complimented the squid’s natural flavor of the sea. The aioli sauce played more to the character of the calamari breading, and gave a kick to the crunch. Pacifica’s menu is a true homage to the sea, so we decided to try two of its famous seafood dishes and one carnivorous delight. The Pacifica’s Barbecued Sugar-Spiced Salmon is presented, like the star it is, on a pedestal of garlic mashed potatoes and Chinese long beans, supported by a ring of fried wonton. The spicy sweet rub is similar in taste to a Jamaican jerk spice, and I was pleasantly surprised to discover that the sweet intensity of the spices actually enhance the underlying meaty flavor of the fish. The long beans were roasted in a fermented black bean paste iconic of Chinese cuisine – such discreet details are found throughout the menu, and are a thoughtful nod to Asian fare. While Pacifica takes deep pride in its seafood selections, it is equally capable of preparing a magnificent steak. The Filet Mignon is served with a white cheddar potato gratin and broccoli, in a savory Zinfandel sauce. The steak was surprisingly moist, smooth in texture, and deliciously satisfying. In an effort to steal the spotlight from its mate on the plate, the potato gratin steps up to seduce patrons with layers of thinly sliced potato, subtle slivers of garlic, and a palate-pleasing crust of cheddar. The last entrée we tried transported us to Southern Asia, and we savored every moment of the excursion. The Pan Roasted South African Seabass, which was first soy-glazed, was accentuated by a green curry-coconut sauce. The silky and invigorating spices also glazed a sticky sushi rice cake, and complimented the side of Chinese bok choy leaves. The delicate flakes of sea bass were intoxicatingly silky, and stood up surprisingly well against the vibrant sauce. Anyone could have stepped away at this point from the meal perfectly satisfied and content, but not us. No, our commitment to the cause inspired us to take one final look at the menu, dessert menu that is, and order the Dessert Tasting Trio: a sampling of the Bon Bon, Burnt Cream, and Meyer Lemon Cheesecake. The Meyer Lemon Cheesecake had a light and creamy texture, and the hint of lemon peaked out to tickle the tongue. The Burnt Cream is Pacifica’s take on classic Crème Brulee, and it proved to be a fine tribute. The crust was thin, crisp, and tasted of caramel; the concealed custard was thick, rich, and silky smooth. The two contrasting elements married for truly seductive bites. Lastly, the Homemade Bon Bon was a mad genius concoction of a small amaretto cookie encircled by vanilla bean ice cream, which was then dipped in Belgian chocolate, walnuts, and a berry coulis. A bite into the layers revealed the real magic – the amaretto warmed the mouth as the ice cream gently melted. The firm chocolate shell offered a slightly bitter base to the sweetness, and the berry coulis was just another fine point to appreciate. Thinking back, it is difficult to separate the satisfying meal I savored at Pacifica Del Mar from the spectacular views I enjoyed. 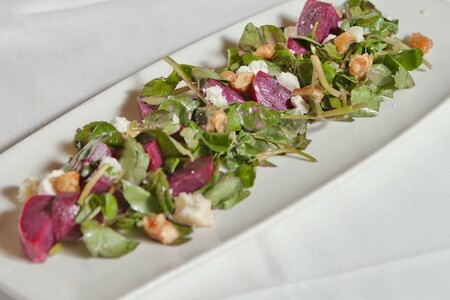 Every dish had a unique perspective of flavor, and each glance out the window revealed an original color palette. 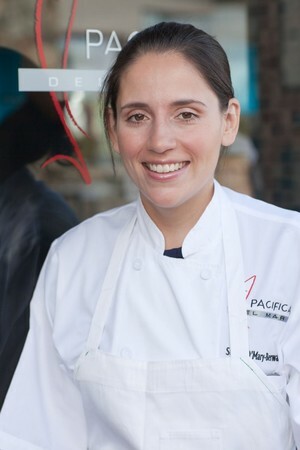 That complete melding of the senses is what makes a dining experience at Pacifica stand out from the competition. Corkage Fee: 18.00 | Per 750ml bottle. Main Dining Room | Happy Hours 5 p.m. - 9 p.m.
Main Dining Room | Happy Hours 4 p.m. - 6:30 p.m.
Main Dining Room | Dinner 4 p.m. - 10 p.m.
Main Dining Room | Lunch 11 a.m. - 4 p.m.
Main Dining Room | Brunch 11 a.m. - 2 p.m. Does the restaurant have an ocean view? Yes, Pacifica Del Mar is one of San Diego's most popular Costal Ocean View Restaurants. Breathtaking views from the patio and inside. Does the restaurant have a bar area? Yes, in fact, Pacifica's Bar features an International Vodka Bar which serves more than 75 of the world's finest vodkas. Do you use sustainable seafood practices? Yes, Pacifica Del Mar supports sustainable, local and organic practices whenever possible? What is the Breeze Café? Pacifica Del Mar’s Breeze Café is a private covered outdoor patios with an Ocean View that holds up to 72 guests for a sit down dinner, or 85 guests for a cocktail receptions. 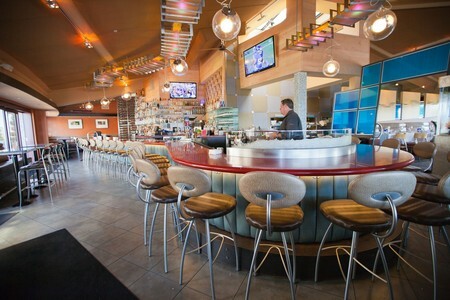 The Pacifica Del Mar bar area and outdoor patio space are fully accessible; the indoor dining space has two steps leading up to it. Does your restaurant have a fish tank in the dining room? Monday-Friday: 5:00pm-9:00pm Saturday-Sunday: 4:00pm-10:00pm. This is a sample menu only. Prices and availability may be subject to change. Monday-Friday: 11:30am-2:30pm Saturday-Sunday: 11:00am-4:00pm. This is a sample menu only. Prices and availability may be subject to change. Saturday-Sunday: 11:00am-1:30pm. This is a sample menu only. Prices and availability may be subject to change. Prices include one complementary glass of champagne, Pacifica bloody mary, mimosa or juice. Two-course preset menu offered until 6:00pm. Choose one featured item from each course. This is a sample menu only. Price and availability may be subject to change. Want to have a great lunch or dinner with a good service,exceptional food and a view of the Pacific like no other in Southern California! Make sure to hit this place when your in the area! Don; I dont know what you're talking about..your taste [I guess] is not up to Pacifica's calibur; I'm sorry for you. Pacifica's is a wonderful place to eat! Great/fun food & beautiful/romantic ambiance. Enjoy! I attend Pacifica quite often and I must say I'm equally impressed each time.. The atmosphere is always very lively and fun.. There is a great bar lounge area to just grab a drink and relax. My favorite is dinning outside along the window admiring the beautiful view.. The food is always spot on.. Japanese clam chowder and the sugar spiced salmon are two of my favorites.. On occasions they have half priced bottle night.. I got my favorite pinot noir Gary Farrel for $40 which is only 5 above retail(usually 80 on the menu) So definitely call and see when they offer that.. Wait staff is great very attentive and friendly.. bathrooms are easily wheelchair accessible..
We reserved a table overlooking the ocean to celebrate a birthday. They seated us right away at one of the best tables in the restaurant. The excellent food and service added to the beautiful sunset setting, even though the restaurant was packed with diners. We were allowed to relax and enjoy our fabulous meal with no sense of being rushed in order to seat the next customers. Our server was attentive without being overbearing-- just the right balance. All in all, it was a perfect evening and absolutely everything we hoped it would be. Thanks Pacifica! After all these years, you've only managed to get better at everything you do! My wife and I, along with another couple, enjoyed a very special evening at Pacifica Del Mar on May 28th. The dinner was to celebrate my wife's birthday and the restaurant staff went above and beyond to make it memorable. Although the restuarant was quite busy, the evening started for us with the waiter holding an excellent table for us...providing us with a spectacular view of the sunset on the Pacific. Our entrees consisted of Ahi Tuna(2), Mussels, and Shrimp Tagliafelle (sp?). All were wonderful with our friends raving it was the best seafood they had ever eaten (and they have eaten a lot!). We had a variety of appetizers and truely loved them all. We did not sample the desserts as we had ice cream and cake planned at home. 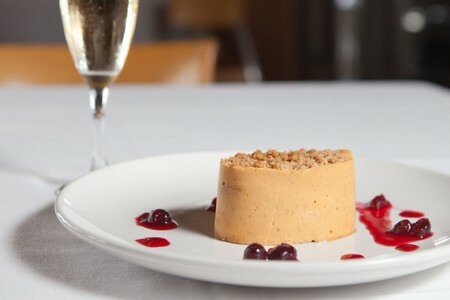 I would consider ourselves fairly experienced and disdcriminating diners and we all agreed the dinner at Pacifica Del Mar was one of our best dining experiences. Great food, great ambiance and our waiter Coop was the best. Coop made the experience for my young family of 5 the best! We'll be back soon. For my first time in this resturant, it is one of the best dining experiences I have had in San Diego. Pacifica Del Mar never fails to give us a superb evening with great food, beautiful view, and wonderful service. It is truly a Del Mar icon--one we send friends and visitors to. 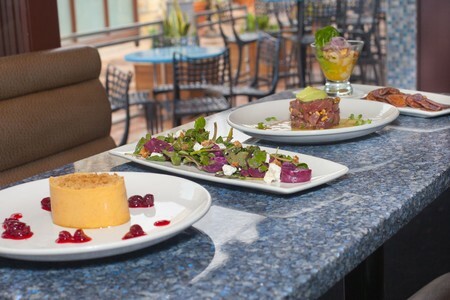 Dining on the patio is a Southern California treat. An evening spent sitting at the bar discussing wine with the bartender is also enjoyable. Always a pleasure to be at Pacifica! Perfect stop along the way. Heading to a concert in San Diego the Pacifica Del Mar restaurant proved to be the perfect early dinner stop along the way from Costa Mesa, CA. All we could hope for and more. We will be back. This was our first visit and we throughly enjoyed the dinner. The service was excellent. The food was prepared well - nice appearance, quality and flavor. 25th Anniversary dinner was great! We celebrated our 25th anniversary at Pacifica Del Mar and dinner was great with great service. If you are looking for a romantic night out, not sure this is the place. Decent view from the patio, but super noisy. If you go there for dinner, bring your ear plugs. We went for Valentine's Day, hoping for a romantic meal. We were willing to spend quite a bit of money and never really treat ourselves. The food was completely average and we were seated 2 feet away from another couple so we could overhear all of their conversations. We dont mind spending $140 on a meal for 2 if it's amazing. This was comparable to Applebees. Keep in mind we didnt have anything but 2 glasses of wine and the prefixed menu. No dessert even for the price. It was ok. The view was very nice, between all the heads trying to see the sunset. I felt a little smashed between one table and the next and the pole our table was pushed up against. Nothing really stood out regarding the food or drinks or waitstaff. It was nice to eat outside. We took the time to have a nice meal together and that is what it was, a nice meal. Nothing more. The qualify of food really varies...one evening food is great, other times not so good. For the price one would expect a quality dining experience every time. My impression is the owners rely upon its location more than its food. Fine view, good entree. They were out of several wines, brought the wrong appetizer, forgot the side, served luke-warm flavorless cappucino and after calling that to their attention also had to ask that it be replaced. Don knows what he's talking about. Pacifica Del Mar has such a great opportunity to be a star in San Diego's food scene, and it falls terribly short. We wanted it to be good, we tried to find the good in it, and it was tough. Fried calamari appatizer (waiters reccomendation) was basic, not bad. Comes with a simple red pepper aoli, same thing you get in 90% of restaurants that have calamair. Nothing to write home about (as was the rest of the dinner). Hearts of rommaine salad was poor at best. Bland dressing, could have done better at home. Had the lobster and the sea bass. Sea bass came out raw (had to be sent back). Lobster and rice pillaf was similar to wedding food. I suppose the best way to describe the food at Pacifica is unimaginative. Service was very good, attentive, personable. All in all it seems Pacifica has been around so long that they don't seem to try to do anything than the basics to retain customers, but they fell short of winning any new ones. Inattentive, disinterested service. Uncomfortable seating. 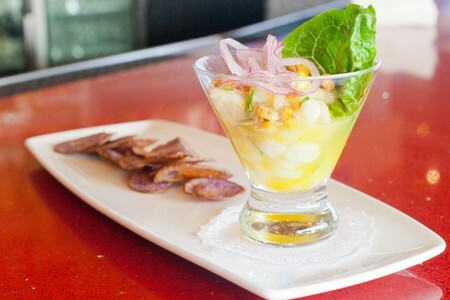 Overpriced – 3 scallop appetizer for $12.00! Catfish totally overpowered by its sauce – no fish necessary. There are far better choices than this. Couldn't use my certificate again! Made a reservation, showed up but couldn't use my certificate AGAIN? Embarrassing. Manager said I can only use it inside and upstairs. What's the difference. Good food though.